The Akita is one of Japan’s oldest native dogs and considered the national dog of Japan, designated as a Natural Monument. It was originally used to hunt wild boar, elk and bear, holding the prey at bay until the hunters arrived for the kill. The Japanese are fiercely proud of this dog, which has become a national symbol embodying loyalty, courage and dignity. The most famous story of an Akita dog is the story of Hachikõ, who was born in 1923 and lived with a Professor near a suburban train station in Tokyo. Every day the Professor commuted to and from work, and every day Hachikõ accompanied his master to and from the station. One day, when the dog was just 18 months old, he waited for his master’s arrival home, but the Professor had suffered a fatal stroke at work and was not on the train. For the next nine years, Hachikõ kept his vigil at the station morning and evening. He allowed the Professor’s family members to care for him, but he did not stop making the journey to and from the station each day in search of his master. This story made the Akita dog very popular in Japan, but two decades later the breed was almost pushed to the brink of extinction during World War II – starving people began to eat them and use their coat for clothing. Eventually, the Government became so concerned about disease it ordered all remaining non-war dogs to be killed. Dogs that survived were either working with the police or hidden by their owners. After the war, American servicemen who had come to know the Akita took them home where they thrived. Strong, independent, courageous and loyal are the key traits of the Akita. They are smart and therefore need plenty of mental stimulation to avoid problem behavior. The Akita has moderate energy levels and are easy to train, but their personality retains a strong link to its past when they worked alone tracking prey. They should never be off leash in an unsecured area, as they will go off hunting on their own. Also, they are also not generally tolerant of other dogs. They are also generally quiet and not prone to nuisance barking. They can be territorial too, which makes them good watch dogs, but they are affectionate and devoted to their masters. Aloof toward strangers, they form strong family bonds – affectionate but not ‘clingy’ with their family. 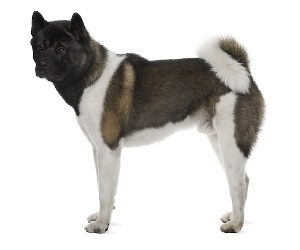 The Akita has a short double-coat with a soft underside and a harsh outer-layer. It needs regular brushing and nail trimming, with extra brushing needed during the shedding period to help get rid of the dead coat. The Akita is not an ideal pet for people with allergies from animal fur. Not an overly hyper breed, It likes to be active and happy with a good walk or job. Like all dogs, the Akita requires regular tick, flea, intestinal worms and heart worm treatments. Consult your veterinarian on treatment options. De-sexing and vaccination against diseases, such as the deadly parvo virus and highly infectious canine cough, are also important to discuss with your vet. Akitas are physically powerful dogs with stubbornness to match and need a strong master who can remain in control. They are not ideal for first time dog owners. Akita’s are tolerant around young children if they are raised with them. Like with all dogs, adult supervision is important around all children. Akitas are active, enjoy being outdoors and need owners who will spend time walking, running and playing with them. They are not suitable for apartment living unless they get plenty of daily exercise.